A shaggy-dog double bill. In 'Beethoven' (1992), Beethoven is a cute, small St Bernard puppy who finds refuge from animal experimenter Dr Varnick in the tidy household of George Newton (Charles Grodin). There Beethoven grows very big and causes near chaos. The sequel 'Beethoven's 2nd' (1993) sees George appalled to discover that the St Bernard and his partner, Missy, have produced four puppies: Tchaikovsky, Chubby, Dolly and Mo. Problem..
Beethoven: You'll love this hilarious comedy about the Newton family and Beethoven - 185 pounds of St. Bernard. It's guaranteed to make even the most reluctant tails wag! Beethoven's 2nd: Beethoven, everyone's favourite St. Bernard, has fallen in love and is ready to settle down with a family of his own. Like it or not, George Newton, his hapless owner (Charles Grodin) is about to discover the meaning of chaos with a quartet of irresis..
Fall in love with the most famous St. Bernard of all time in the original blockbuster, Beethoven. Barely escaping from nefarious dognappers, an adorable puppy named Beethoven adopts the unsuspecting Newton family- and promptly grows up into 185 pounds of romping, drooling, disaster prone dog. Unfortunately, even after proving his canine credential to mom and the kids, the heroic hound gets nowhere with the uptight dad, George (Charles G..
Fall in love with the big-hearted wet-nosed star of this outrageous comedy hit from producer Ivan Reitman. With evil dognappers hot on his heels, an adorable puppy named Beethoven adopts the unsuspecting Newton family - and promptly grows up into 185 pounds of romping, drooling, disaster-prone St. Bernard! Charles Grodin is George, the none-too-thrilled father whose disdain for the cuddly canine turns to loyalty after Beethoven becomes ..
America's top dog is back, and this time, he's bringing the kids! Charles Grodin and Bonnie Hunt star in this hilarious comedy about the further adventures of the Newton family and their lovable, lumbering pal, Beethoven. In the second "symphony" of the Beethoven saga, our hero meets Missy, the lady Saint Bernard of his dreams. Unfortunately, they are soon seperated by Rigina (Debi Mazar), Missy's hateful owner who is using her as a bar..
America's top dog is back, and this time, he's bringing the kids! Charles Grodin and Bonnie Hunt star in this hilarious comedy about the further adventures of the Newton family and their lovable, lumbering pal, Beethoven. In the second "symphony" of the Beethoven saga, our hero meets Missy, the lady Saint Bernard of his dreams. Unfortunately, they are soon separated by Regina (Debi Mazar), Missy's hateful owner who is using her as a bar..
Own Beethovens 3rd DVD from Deff, DVD, Blu-Ray & 4K Video Specialists - Free UK Delivery.. When Beethoven's lack of social graces gets to be too much for the Newtons, the kids secretly enroll him in an obedience school. A Beethoven-style twist on the tale of the Prince and the Paw-per is unleashed, when during a walk in the park, Beethoven gets loose only to find himself mixed up with Michelangelo, a perfectly-trained dog who looks just like him! While the Newtons can't believe how well-behaved their dog has suddenly become, .. When Sara takes Beethoven to spend summer vacation with wacky Uncle Freddie in an old mining town, the mischievous canine "digs up" the missing clue to a legendary hidden fortune. Now everybody wants to be the dog's best friend as his discovery unleashes a frenzy of treasure hunting among the community's cast of kooky creatures. But the adventure proves more than they bargained for when they encounter the ghosts that protect the town's ..
Fall in love with the big-hearted, slobbering 185-pound St. Bernard, Beethoven, in this howl-arious adventure that features an all-star cast, including Jonathan Silverman (Weekend At Bernies), Rhea Perlman (Cheers), Moises Arias (Hannah Montana), Stephen Tobolowsky (Heroes), Oscar Nunez (The Office), Cesar Millan (The Dog Whisperer), Joey Fatone (NSync) and Eddie Griffin (Undercover Brother). Although animal handler Eddie (Silverman) wo..
Own Beethovens Big Break DVD from Deff, DVD, Blu-Ray & 4K Video Specialists - Free UK Delivery..
Tis the season to celebrate with everyone's favourite St. Bernard, Beethoven, in an all-new, heartwarming holiday adventure where the hilarious canine speaks for the first time! When Henry the elf (Kyle Massey, TV's That's So Raven) flees the North Pole with Santa's sleigh and his magical bag of toys, he crash-lands the precious cargo in a suburban neighbourhood tree. But when the bag ends up in the wrong hands, it's up to heroic Beetho..
Collection of eight family adventures featuring the world's most famous St Bernard. In 'Beethoven' (1992), a small St Bernard puppy finds refuge from animal experimenter Dr Varnick (Dean Jones) in the tidy household of George Newton (Charles Grodin). There Beethoven grows very big and causes near chaos... In 'Beethoven's 2nd' (1993) dog owner George Newton (Grodin) is appalled to discover that Beethoven has gone and had some babies with..
Get ready to howl with laughter in this all-new family comedy starring everyone’s favourite St.Bernard, the one and only Beethoven! After a doggone disaster of a movie shoot, the big-hearted pooch and his trainer, Eddie (Jonathan Silverman, Beethoven’s Big Break), are heading home when they get stranded in a small coastal village. 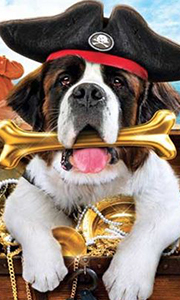 When Beethoven befriends a local boy (Bretton Manley, Ted), he helps him fnd a pirate map to lost treasure ..
Beethoven, America's loveable St. Bernard, is in the biggest doggone collection ever. From his beginnings as a puppy on the run from dognappers, to his travels across America, this collection features all five hilarious adventures. When the Newtons first bring home a tiny St. Bernard puppy, they would have never guessed how much his larger-than-life personality would change their lives for ever. Each film features Beethoven's drooling, ..
Beethoven: Fall in love with the big-hearted, wet-nosed star of this outrageous comedy hit. With nefarious dognappers hot on his heels, an adorable puppy named Beethoven adopts the unsuspecting Newton family - and promptly grows up into 185 pounds of romping, drooling, disaster-prone St. Bernard! Beethoven's 2nd: In the second "symphony" of the Beethoven saga, our hero meets Missy, the lady Saint Bernard of his dreams. Unfortunately, t.. The story begins as the Newton household prepare for a cross-country drive to a family reunion. For Richard, the father, it's a dream vacation. For his family it's boredom on wheels - until the appearance of a surprise passenger. Along for the ride is the huge, slobbering and loveable dog, Beethoven who soon unleashes a string of canine calamities! But when two bumbling thieves threaten the safety of the Newtons, it's Beethoven who sets..